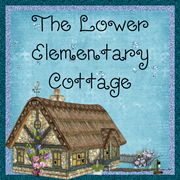 The Lower Elementary Cottage: Turkey Hats, Thankful Writing, & Another Autism Milestone! 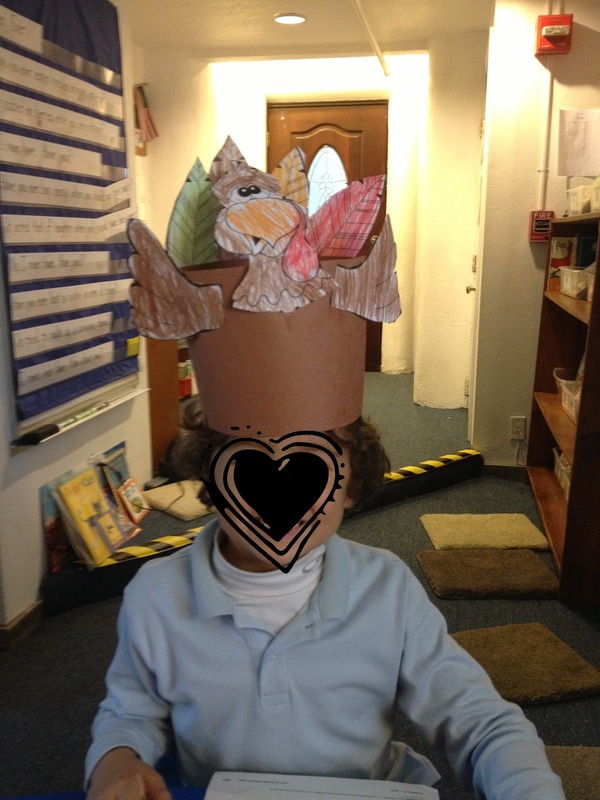 Turkey Hats, Thankful Writing, & Another Autism Milestone! His little face is soo adorable it kills me to hide it! We made turkey hats, which are always fun. The things I can get away with being a kindergarten teacher... 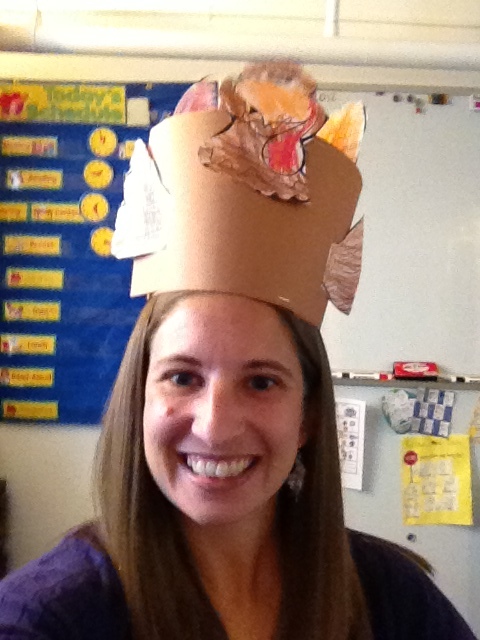 I love that turkey hats are part of my job description! The bottom of the page says it's from Carson Delosa, but I have no idea which book the pattern came from. It's been in my Thanksgiving file for years. I'm guessing it was a fabulous donation to the poor first year teacher (me!) 7 years ago at my old school. One of the kids also put theirs on my head and took a picture of me. The boys (did I mention my WHOLE class is boys this year!) wrote what they are thankful for. We're turning them into books next week. I need to decide how we're making the covers. I can't decide if I should just hand them construction paper and see what they draw, or if I should choose a picture to print and have them color for the cover art. 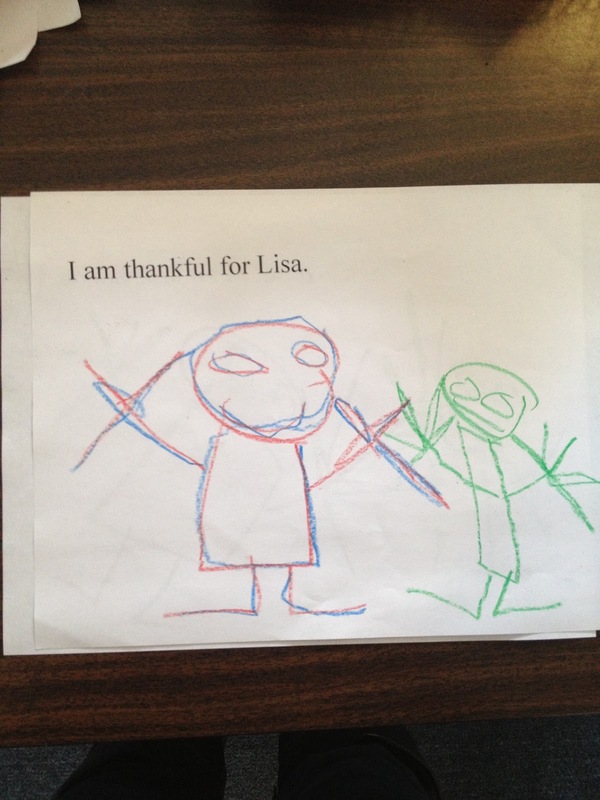 One of my cute little buggers wrote "I am thankful for Lisa" which warmed my heart considering his first page was "I am thankfully for Mommy." I'm up there with Mommy and that's a pretty big deal for a 5 year old! I love the illustration he made of me! He drew me in red, then asked my favorite color (blue) and traced over my picture in my favorite color. Another little guy wrote "I'm thankful for my teacher." Yay me!! The wonders of kindergarten and the unfailing love kids have for their teacher! Later in the day the social skills teacher had the kids write me letters. They were super cute, and funny too. I forgot to take pictures of the words, but I'll post them next week just for fun. My favorite one said, "Dear Lisa, You are really good at telling people what to do." Gee thanks kid! Haha. My little guy who had a huge moment last week, had another fabulous leap in social skills this week! I'm loving every minute and making a huge deal of all of his successes! I'm crossing my fingers these jumps are permanent and more just keeps coming! First off, my little guy (who is in his own world a lot) started making spontaneous eye contact this week! I caught him making eye contact while talking to me 10 times yesterday!!! That's huge! Normally he "fakes it" and bugs his eyeballs out at me while he says/asks me something. Yesterday he did REAL eye contact with zero prompting! I give him special pluses on his point sheet for "thinking about me with his eyes" so it's been a good motivator. Then his next big leap was his ability to "pretend" in multiple situations. The speech teacher plays "I got your nose" and he goes to speech class upstairs to "get his nose." It's hysterical. Yesterday he came to class and pretended to sleep at his seat with pretend snoring noises and everything. Later he started pretended to lick an ice cream cone using his pencil. I know these are totally normal things for kids to do, but not this kid. I've NEVER seen him pretend until this week! He's been learning to count money this week and was bugged by the fact that I didn't have pretend dollar coins like his assignment involved on paper. Then, as luck would have it, Starbucks gave me a dollar coin for change! I handed it to him and you would have thought I gave him the greatest toy in the world! He squealed! Then obsessed over that coin for 2 hours until he went home. Too funny! I love the turkey hat. 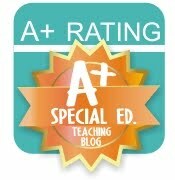 Great story about your boy with autism! How fun to see him grow like that. How fun to have a whole week off. Love the turkey hat! We make lots of hats in my classroom too. It's great fine motor practice and the kids always love it.